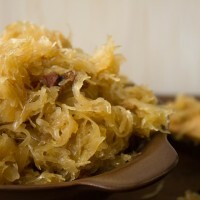 Sauteed sauerkraut (štovēti kāposti) is my “must-have” Christmas dish. Ever since I can remember, my grandma would spend most of the Christmas Eve in the kitchen boiling, frying and sauteing sauerkraut, potatoes and meat, while the kids would go to the markets to pick out the best looking Christmas tree. Christmas Eve would be celebrated with a feast, including compulsory mandarins and whipped cream, as well as presents that could only be received in exchange for a song or a rhyme. 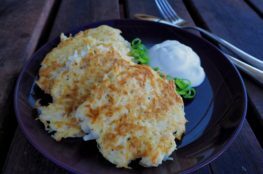 The dish itself is very simple: it consists of sauerkraut (fermented cabbage), fat and sugar. Every family would have their own recipe and every family would think that their recipe is the one. There are many ways to make sauteed sauerkraut and many potential additions: bacon,carrots, apples, tomato paste, garlic, honey and barley. This recipe is how my grandma is making sauteed sauerkraut and I still make it her way every time I feel homesick. Drain the sauerkraut in colander and place in a large saucepan. Add the water, bring to a boil. Reduce the heat and simmer for 1.5 - 2 hours. Drain the sauerkraut in a colander, making sure no excess liquid is left. Melt the sugar in a large frying pan until it is golden brown. Add lard and gently stir until sugar and fat has melted together. Add the sauerkraut to the pan and cook, stirring occasionally, for 10-15 minutes until golden. Sauerkraut is best served with pork or smoked, cooked sausages and boiled potatoes. 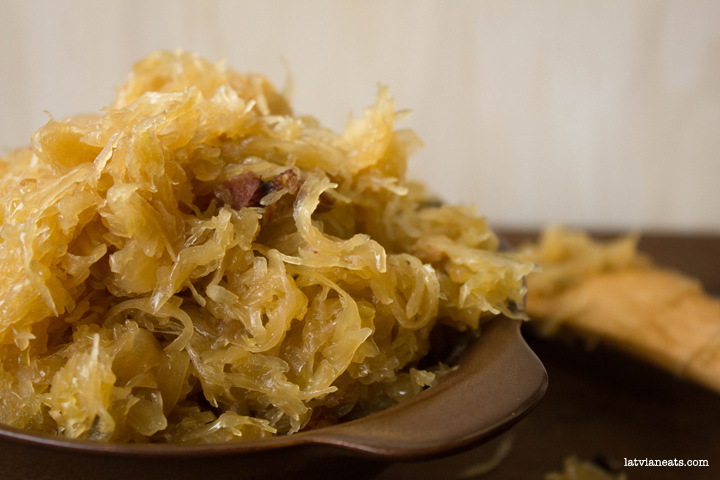 Sauteed sauerkraut can also be used in piragi (pies) as alternative to bacon. My mother’s recipe required carrots and caraway. As you said, every Latvian makes this “their” way. Too many people just dump plain sauerkraut (heated first) onto a plate and so no wonder people say they don’t like sauerkraut! Braising it and adding the sweet and fat like this, plus the other additions that make each recipe unique, turns that plain sauerkraut into a very delicious dish indeed. 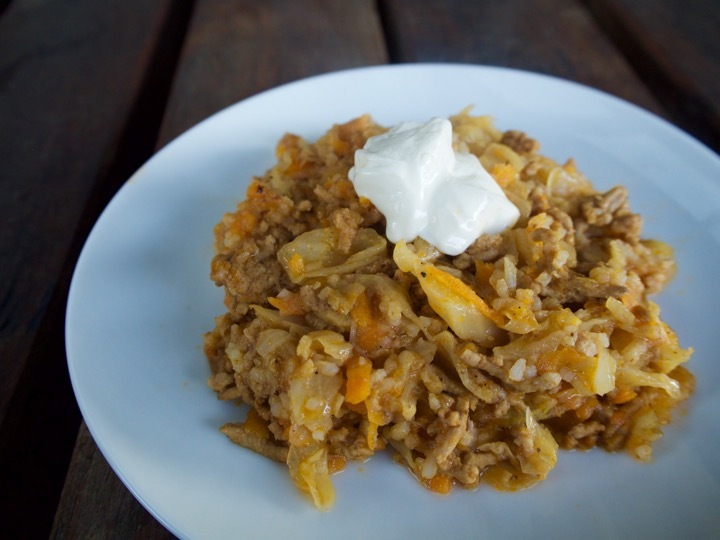 I absolutely love this sauerkraut dish (which Latvian doesn’t?)! A prime candidate for helping cure homesickness, particularly in cold weather. My recipe is very similar, except I like to use less water and sauté the whole thing in a French oven for at least three to four hours; then caramelise a very finely chopped onion the way you do with lard and add to the mix. Recently I invented a non-vegetarian friendly variant using a typical Anglo ingredient – ham hock (of pea and ham soup fame) – by stewing it in the pot with the sauerkraut. Three hours later, take it out, shred, skin and all, and mix it back in, then proceed as usual. 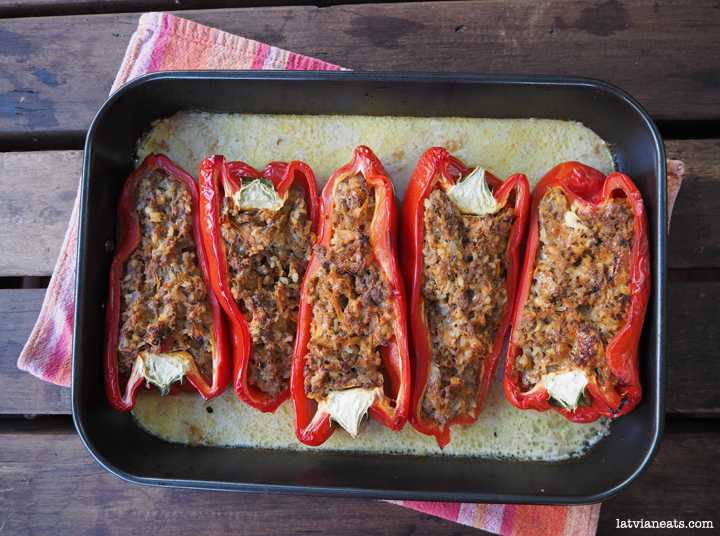 Saves cooking kotletes on the side, as the meat is already mixed in! I think my mum used to add pork belly to her recipe, hence the idea. As I recall in my family this dish would always be also served on the day after a wedding celebration “Atkazas” as well. It was tradition to hide the “Kaposti” that the mother-in-law had made ahead of time. This was done so the “Kaosto” dish could not be served up. When it was served on the second day of a wedding it was the signal to go home the party was over. I love your recipe’s. I have another version that came from my dad… Interested? Contact me. My father’s recipe is a tad more elaborate, takes all day in the oven, but is worth the effort. I start browning 200 gms of sliced onions with the same amount of speck sliced thinly, in a large oven proof casserole. The sauerkraut is added after rinsing in cold water, together with a quarter head of shredded fresh cabbage; chicken stock is added to cover the kraut and cabbage. Add 2 chopped apples, stir in quarter cup brown sugar, a tablespoon of caraway seeds, and a quarter up cider vinegar. Stir and bring to a simmer. Into the oven at 150 till the liquid is all but gone and kraut dark brown. About 6 hours. Missing here is sald scab maize, beige zupa and capost zupa, my favorites. I learned how to make sald skab maise from my mother who made the best.